(Phys.org)—On Nov. 13, 2012, the sun emitted a mid-level solar flare, peaking at 9:04 p.m. EST. Solar flares are powerful bursts of radiation. Harmful radiation from a flare cannot pass through Earth's atmosphere to physically affect humans on the ground, however—when intense enough—they can disturb the atmosphere in the layer where Global Positioning System (GPS) and communications signals travel. This disrupts the radio signals for as long as the flare is ongoing, anywhere from minutes to hours. This flare is classified as an M6 flare. M-class flares are the weakest flares that can still cause some space weather effects near Earth. They can cause brief radio blackouts at the poles. This M-class flare caused a radio blackout categorized according to the National Oceanic and Atmospheric Association's Space Weather Scales as R2—or "moderate"—on a scale of R1 to R5. It has since subsided. By observing the sun in a number of different wavelengths, NASA's telescopes can tease out different aspects of events on the sun. 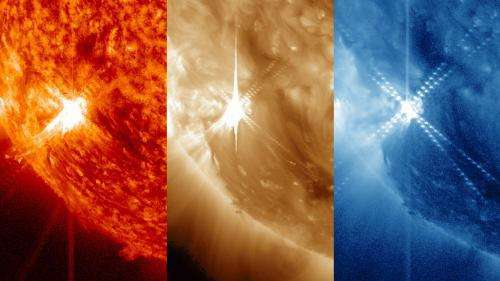 Three images of a solar flare on Nov. 13, 2012, captured by NASA's Solar Dynamics Observatory (SDO), showed light in the 304 Ångstrom wavelength, which shows light from the region of the sun's atmosphere where flares originate; light from the sun in the 193 Ångstrom wavelength, which shows the hotter material of a solar flare; and light in 335 Ångstroms, which highlights light from active regions in the corona.